I know this but after an evening answering questions at a local famer’s market I decided I needed as refresher on Raw Honey myself – just in case I was omitting some points. I found the following on a blog called Honey Traveler. Raw honey is honey that is unheated and minimally processed. It is pure honey where nothing has been added or removed. To be raw, honey should not be heated above temperatures one would normal find in a hive (approximately 95 degrees F). Additionally it should not be ultra-finely filtered to the point of removing pollen and organic materials that are an intrinsic constituent of honey. Unheated, “raw” honey contains all the vital ingredients that give it its healthful properties and wonderful aroma. Most commercial honey you see in supermarkets is not raw honey. This mass produced honey is often heated to temperatures far above the normal temperatures of the bee hive. Heating past the maximum hive temperature of 95 degrees Fahrenheit changes honey’s essential composition and degrades its quality. It partially destroys honey’s beneficial enzymes and ‘boils off’ volatile compounds that account for the unique, delicate floral aroma of the honey. This is done to make it easier to extract from the honey comb, to filter it, to package it, to ‘pasteurize’ it to kill benign yeast and prevent fermentation and to delay crystallization. Micro-filtering also degrades the healthful properties of honey by removing beneficial pollen residue. Much commercial honey is micro-filtered, often using a diatomaceous earth (DE) process to eliminate even micron-sized particles. Why go to these lengths when a relatively coarse strain would result in a clear, visually beautiful product and not remove healthful pollen? The reason is to slow down the naturally occurring crystallization of honey. Tiny particles act as ‘seeds’ for the crystallization process, by removing them with micro-filtering, crystallization is delayed. But crystallization is not a problem to be solved. Almost all honeys crystallize after time. It is actually a good sign the honey is raw. To re-liquify, simply heat the honey jar in warm water (104 F, 40 C) until it returns to the liquid state, stir occasionally to transfer heat, and replace the hot water if needed. Note some honeys will not crystallize easily because of low glucose levels and in these cases, this is not a sign of heating or micro-filtering (ex. honeydews, black locust-acacia, tupelo, sourwood, sunflower, sage). A good trick to ensure you are getting raw, unprocessed honey is to purchase it in the comb. Many of the healthful organic compounds and substances in honey are destroyed or inhibited by heat. The main enzymes in honey are invertase (saccharase) diastase (amylase) which break down sugars and help digestion. The enzyme glucose oxidase produces the antibacterial, antimicrobial hydrogen peroxide, a well-known disinfectant. Dependent upon enzymes and a wide range of compounds in honey, antioxidants are substances that can retard or inhibit oxidation and/or neutralize the effects of damaging “free radicals”. Increasing the body’s antioxidant content may help protect against cellular damage and the development of chronic diseases. Other antioxidants include polyphenols, flanonoids and phenolic acid in Raw Honey. Polyphenols in foods are thought to play important roles in human health such as cancer preventative, and anti-inflammatory, radical scavenging and antioxidative activities. The most important classes of antioxidant polyphenols are the flavonoids and phenolic acids. It is these substances in honey, wine, fruits and vegetables that are most responsible for the antioxidant characteristics, and thus the healthy image of these foods. Darker honeys like Buckwheat honey are stronger antioxidants compared to lighter honeys. In a review published last week in The Journal of Functional Ecology, researchers asked: What is a flower like from a bee’s perspective, and what does the pollinator experience as it gathers pollen? And that’s why we’re talking to you in the second person: to help you understand how bees like you, while hunting for pollen, use all of your senses — taste, touch, smell and more — to decide what to pick up and bring home. I live on a sand hill. No joke, a sand hill with minimal nutrition for plants. It’s mostly pine and scrub oaks. Some hardwoods have found a way to survive and provide some forage for the bees. Drought resistant wildflowers come up along the roadways and power lines. The chain of nutrients from soil to plant to bloom doesn’t improve along the journey. Although it can be said I live in the pollen belt, the pollen here is of poor quality. I have resigned myself to providing supplemental food for the bees during the times of pollen and nectar dearth. They won’t take it if nature provides something better. I had a professor in college once that said protein was the currency standard in food and nutrition. More and more we are learning that with our honey bees it plays a vital role in their immune systems as well. A well fed bee is a healthier bee. You are called “the Bee Man,” or “the Bee Lady” by a lot of people who don’t know your name. You don’t mind driving home with a few honey bees inside your vehicle. Your family and friends know exactly what they’re going to get for Christmas. You don’t mow the lawn because the bees are working the weeds. You pull over and check the bees on the wildflowers just to see if they are YOUR bees, AND — you can tell the difference. You come home smelling like a camp fire, and you haven’t been camping. You saw Ulee’s Gold and didn’t think there were enough shots of the bees. You overhear your 9 year old daughter explaining to her friends how to tie a trucker’s hitch. You’ve ever used bee boxes as furniture in your house, for coffee tables, chairs, night stands, and storage boxes. You get stung by the bee that was clinging to your husband’s bee suit when you picked it up to wash it. You know you’re a beekeeper when the seat of your car or truck has a hole where the hive tool punched through. You might be a beekeeper if, while cleaning out the garage, you get excited when you find a couple misplaced SHB traps. You might be a beekeeper if you visit the SC Surplus Salesroom and the only things that interest you are table saws (for cutting boxes), kettles (for melting wax), deep freezers (for freezing frames), and hot water heaters (for that distant honey house). You watch Ulee’s Gold just to see the shots of the honey bees. You might be a beekeeper if you go into a manic state of excitement when your spouse reminds you that you left a 50# bag of cane sugar in her car trunk 2 months ago and she’d like it removed. You look through beekeeping catalogs for beekeeping equipment you think you can make. When you have more pictures of your bees than of your kids — and justify it by claiming bees only live six weeks, there are different bees in each picture. When, after being asked how the bees stay warm overwinter for the eighth time, you’ve joked about knitting them sweaters — and someone believed you. When you finally said, ‘no, they don’t sting me’ because it was faster to say that than spend the time explaining things to non-beekeepers. The inside of your clothes dryer has propolis spots. You have to buy a new freezer for your food because the other is full of frames. When you buy a second dishwasher to put in the garage to clean plastic frames prior to re-waxing because it’s easier than the pressure washer. Someone gets in the car with you and ask if you had been smoking! You might be a beekeeper if you consider using Swarm Commander as an aftershave. You might be a beekeeper if you use a tractor front loader and deer stands to retrieve swarms. 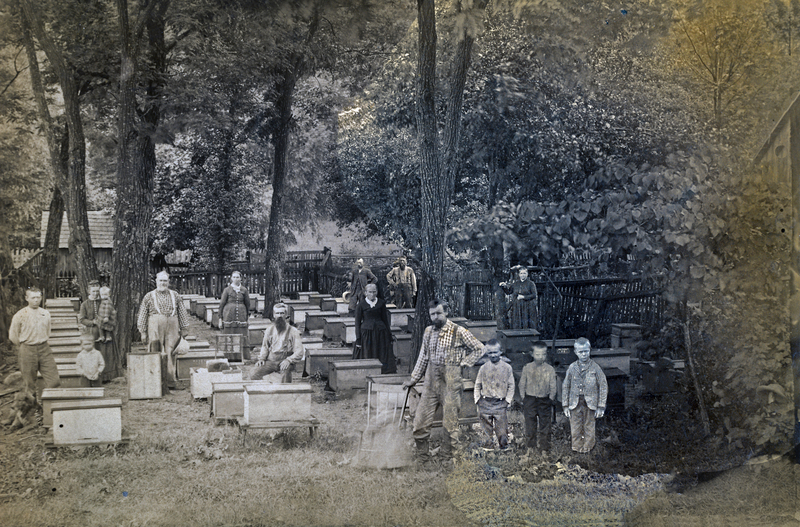 An interesting article on beekeeping in an earlier era. Especially a Mr. Abraham Graffis II, beekeeper of Rushcreek Twp. I’m out in the bee yard vaporizing oxalic within the hives to kill Varroa mites today. Oxalic Acid is harsh on humans and I think it probably isn’t exactly kind to honey bees either although they seem to live on the acid side of the ph scale. I’m reminded though, as I vaporize the oxalic acid within each hive, of a time my son Danny had a nasty wart on his foot. We had tried everything, night after night, to remove it. Finally Danny agreed to go to a podiatrist . He thought it was going to be cut off and he was good with that. Instead the doctor applied a strong acid for a couple hours. Over the course of the next week or so it was basically blistered and burned in appearance. We felt badly for Danny but he was okay with it. He wanted it off. Anyway, applying oxalic acid to the bees kind of reminds me of the same. I hope they appreciate the mite removal.